Hi! I hope everyone has had a great month! It's almost over already! The fourth card for July is one that I got a lot of enjoyment out of making. There's nothing therapeutic like coloring, for me that is. Fussy cutting things out also has a calming effect on me. I started with a 5" x 5" square white card, and chose the beautiful green dotted paper from the Blushing Rose Collection to layer on the front. (I must apologize for my photos being a little off in the color - computer issues, then more computer issues!) Using the Decorative Corners die, I cut two of the heart corners, and glued them in opposite corners. The photo above doesn't show an accurate shade of green for the base, like below. I found some pretty coral grosgrain ribbon in my stash, and glued that from upper right corner to lower left corner, then trimmed the edges evenly with the cardstock. I made a small loop out of the ribbon and glued that in place also. 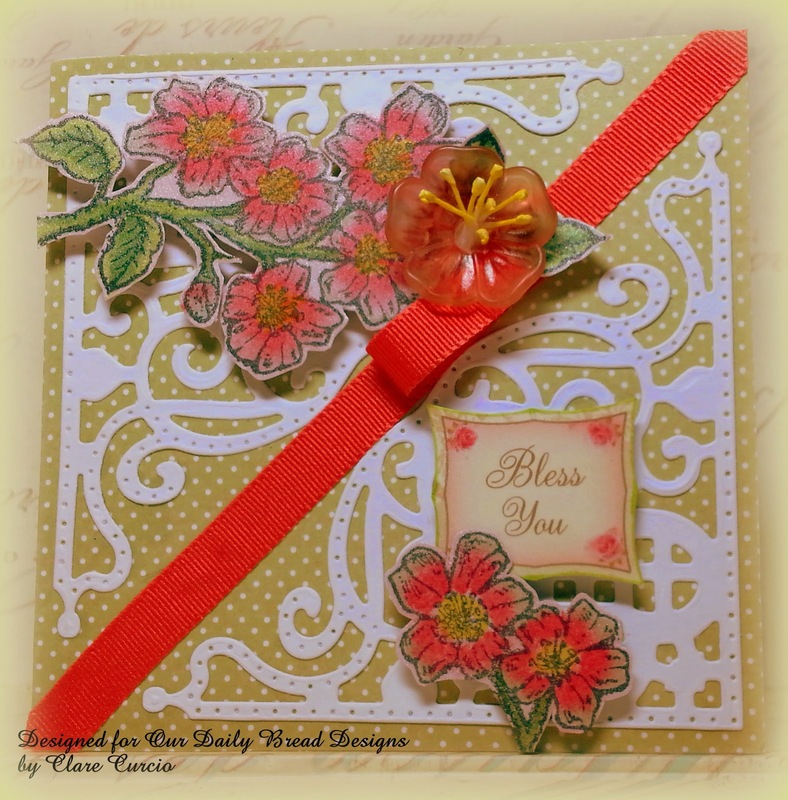 In the Blushing Rose Collection of paper, there are two sheets of sentiments from which I cut the square saying, "Bless You". 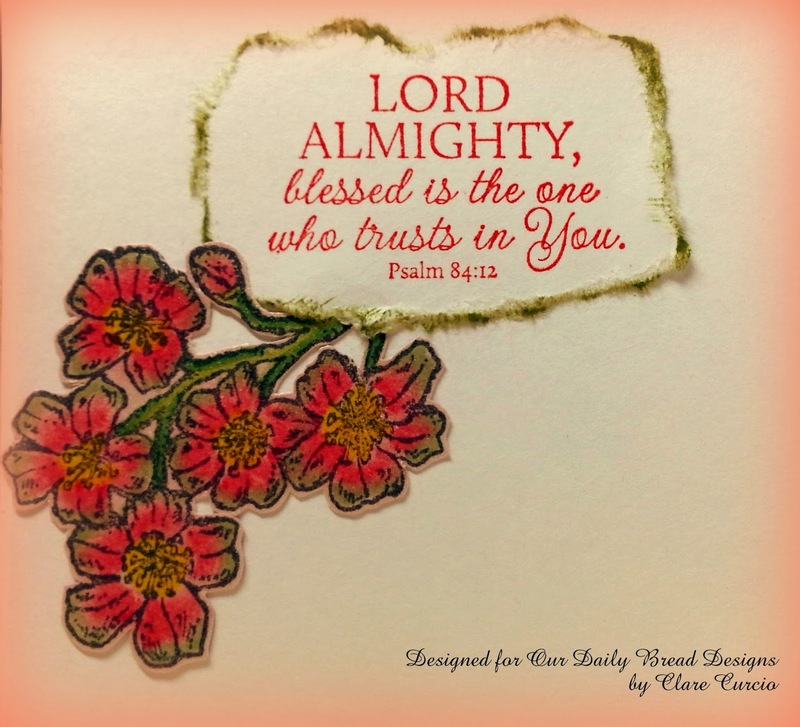 The roses on this sentiment were much more of a pink, so I touched them up a tiny bit with some coral ink. That's what is so nice about these papers! With a little bit of color, they can be changed ever so slightly to match another image, or use them as beautiful as they are. The last thing I did, (and the most fun!) was stamping the flowers from the set Cherry Blossom onto pink shimmer cardstock three times, the third time so that I could cut it up and use parts of it. I used Copic markers to color the flowers, After cutting them out, I positioned them, and adhered to the card front as shown with dimensional adhesive squares. The Bless You sentiment was also applied this way. The button was an opaque white, from my stash. I used a coral marker to color it, placed some yellow stamens in the center, and glued it over the end of the Cherry Blossom branch and the end of the ribbon loop. I added a couple of the little leaves from the cherry blossoms I had been cutting on under the button. For the inside - I stamped the sentiment from the set Bloom on a piece of white scrap cardstock, in a coral ink then tore the edges. I sponged them with a little green ink and applied this piece flat onto the left side of the inside of the card. Tucking in just the stem, I also adhered flat another of the Cherry Blossom branches. That's it - so easy! Here's the things you will need. I hope you've enjoyed your visit, and I hope you'll come back! I've loved having you! Claire, what a beautiful card, and I love the inside too - such an important part as well! I love the papers and the dies you've used, and your cherry blossoms are beautiful! Thanks for sharing this card to inspire us again this week! Hugs! 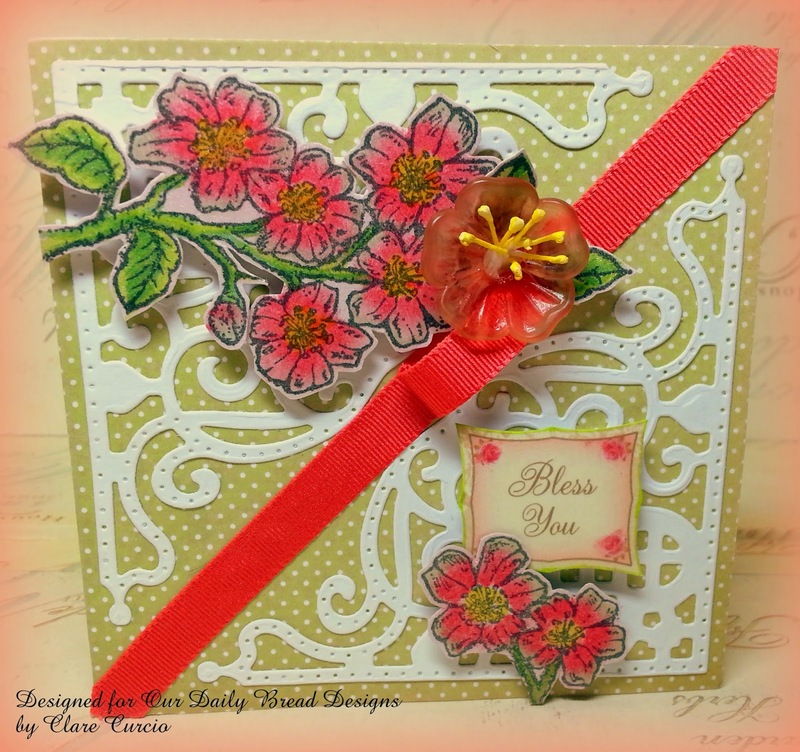 Clare, this is just so beautiful.... as have been ALL your cards this month for ODBD!!!! Your cherry blossoms are so pretty I want to reach out and touch them! Love how you used the corner dies for a beautiful layout! Love your inside as well!!! Beautiful!!! !